Do you think women should be submissive to their husbands? After having a conversation with a group of older ladies, I really began to wonder. I was asked if I was submissive to men and told rather matter-of-factly, that I would continue to be single and forever lonely until I learned how to cater to my man! They went on to say that young women are more about friends, careers, etc. first and treat men as a last priority. Their definition of being submissive was that their needs are met after his and to allow the man to make choices and simply follow. Call me crazy, but I’ve been making decisions for myself for quite sometime and I don’t need anyone making them for me now. I have no problem collaborating, but it sounds to me they are saying I need to relinquish all freedom and personal choices. That isn’t an option so now what? Thank you for reaching out to BrotherWord and allowing me to answer an age-old question that has taken on many new meanings in today’s society. As women have become empowered and been forced to take on new roles within the family, the ideals of relationships and how they are governed have become misconstrued, misinterpreted, and misappropriated. Men, listen to me well and please hear me. Your lady, spouse, wife, significant other is NOT your doormat, maid, concubine, or subservient. She is your helpmeet and is there to support, encourage, uplift, and act as a counter-balance, sounding board, and voice of reason. What she brings to the relationship is equally important and just as vital, so please do not diminish it, belittle it, or taken it for granted. 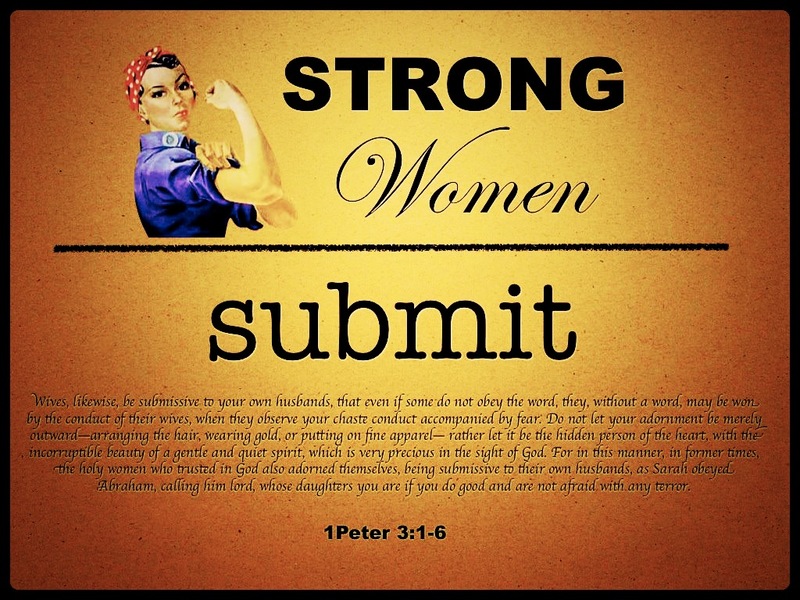 Women, I understand you have been asked to do more than you were ever designed or meant to do and have been placed in situations where being submissive to anyone was not an option. You have had to demonstrate a sense of strength and endurance that was never intended for you, but was necessary to make sure that anyone watching you and following your lead, knew what it looked like to overcome and strive in spite of obstacles or anything or anyone that was lacking. Over the past few decades, you have had to run the house and the boardroom and although it has given you a sense of pride and power, it has also caused a rift between man and woman. She feels she no longer needs a man and he feels he must dominate her. Both could not be more wrong. 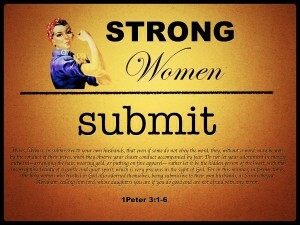 Men, if you want your lady to submit to you, follow these simple rules. 1.) Love her unconditionally, completely, with your mind, body, and soul. Love her as she wishes to be loved; learn her love languages and cultivate them and nurture them. Listen to the verbal and non-verbal cues and allow them to be teaching moments to better your relationship. 2.) Include her as a partner and confidant. Let her know her opinion is desired, appreciated, and valued. Your relationship is based on unity and trust, not a dictatorship. It is a collaborative effort. 3.) Lead by example so when you are unable to collaborate in advance, your decisions are not questioned because experience has built trust and knowledge that whatever you do, it is for the betterment of the family first and foremost. 4.) Be a man of integrity, ethics, and honor. Let your word be your word and your actions match those words. If you say you are going to handle a matter, make sure it is done and done in a timely manner. Nothing impresses more than follow through and nothing gives more comfort than knowing that when you say you will complete a task, it is handled without confusion or conflict. Ladies, you too have to make a few amends. 1.) It’s one thing to be the CEO, COO, CFO, the one in charge at work, but just as much as you do not not want to be bossed around, no man wants to come to that either. If he has proven and shown you that he is capable of leading the family, why not allow him? Is that not what you have been asking for and desiring? And even if he has made mistakes, give him the room to learn from those mistakes and better himself. Tearing him down does not build confidence or support the partnership. 2.) If you are not your man’s biggest cheerleader, you are doing him and you a grave disservice. Your man will thrive off your positive reinforcement and will move mountains on your behalf when he knows you are in his corner. You may thinks it is trivial, but any man worth his salt wants to know that his lady believes in him and will walk with with and follow him to the end of the earth if need be. 3.) Allow him to be a man. If he is priest, provider, and protector, give him reign to do so and stop emancipating and ridiculing him at every turn. Stop challenging his manhood and/or stifling his abilities. Stop pitting him against or comparing him to others. Please give him room to succeed and fail; show him you trust him and his decision-making ability. She should love, trust, and believe in him so much that she should without reservation feel at ease at allowing him to lead their family in the direction he thinks is best and sees fit for the future. His past experience and actions have proven that his first priority is to provide and protect the family and he will give his all, including his life, to assure that the family is always well take care of and their needs are met. His decisions are based on the family unit and not selfish or destructive motives. He loves, respects, and trusts his helpmeet and soulmate so much that he seeks her advise and counsel on all matters. And on the rare occasion when he is unable to do so, he takes into consideration how things will affect the family unit and makes the best decision for everyone. His dedication and love for the family is so consuming it is easy for her to submit in love knowing that even when he fails, he failed doing what was best for the family. Her submission is not out of fear, rhetoric, or societal or religious conform, but based on an undying connection. It is based on the honor and respect she has for him and because of an iron-willed dictatorship or chauvinistic demeanor. She submits because he has loved her into submission. She has released all doubt, fear, separatism, and disbelief and her idea of submission revolves around a level of trust in him and their union. To submit is not giving up control, but gaining confidence in the one you are with. New Millineum Woman, when that man comes along that answers all your heart’s desires, fulfills your dreams, and proves his worth and acumen, submit to the love he gives you, allow the walls to slowly come down, and get ready for a blissful future. What do you think? Should women be submissive? Should men expect their ladies to submit? Leave your comments here or @BrotherWord or Facebook.com/BrotherWord with the hashtag #Submit. Awesome post! This right here is EVERYTHING: “She should love, trust, and believe in him so much that she should without reservation feel at ease at allowing him to lead their family on the direction he thinks is best and sees fit for the future.” If more men understood this concept, I think order would be restored in many homes, and therefore, the world. And for the women: “Allow him to be a man. If he is priest, provider, and protector, give him reign to do so and stop emancipating and ridiculing him at every turn. Stop challenging his manhood and/or stifling his abilities. Stop pitting him against or comparing him to others. Please give him room to succeed and fail; show him you trust him and his decision-making ability.” This is critical as well. You made some very good points here.